When the right moment hits for a great weekend getaway prepare to seize the hours with gusto. As anyone over the age of college weekends knows, the right getaway on the perfect weekend can improve your outlook when you need it the most. Occasionally, the perfect getaway presents itself all in one package with a bow on top. However, you stand a far better chance of creating opportunities for just the right pocket vacation with a little preparation. Depending on your locale, you cannot go wrong by keeping a to-go bag handy. Most of the time the logical place to stash essentials is in your trunk. Often, any fellow travelers look askance at any weekend gear actually stashed in supermarket bags. If your perfect weekend getaway typically involves camping, hiking or other rugged, outdoor activities, consider investing in a mid-size backpack. You may find the idea of a sturdy, classic duffel bag that leans toward the classy side more your style. Whatever you choose, you cannot go wrong with lots of pockets. Backpack or duffel, it never hurts to have a quality, lightweight sleeping bag along. Even a hotel room couch is more comfortable with your own sleeping gear. Keep cosmetics and gadgets to a bare minimum. Remember, if you cannot live without something, it is probably already in your getaway bag. Most essentials are available for purchase along your route or at your destination. Keep travel size samples of toothpaste, shampoo, and other toiletries. Always pack an extra toothbrush. 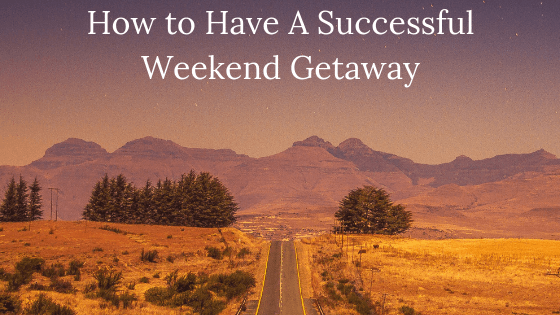 A spontaneous weekend getaway is most likely to leave you refreshed and well-rested if your destination is easy to reach, as well as a reasonable drive home. While you may be anxious to take off on your weekend adventure, check with any travel buddies to make sure their return plans coincide with yours. If not, you do not need to abandon your quick getaway, simply adjust your transportation ahead of time. When you prepare your getaway bag, take inventory of your mental baggage. You know what activities relax you. Adventures others find exciting may stress you out if your goals demand alone time. No apologies are necessary. Circumstances change in life, and you are far better off coping in a positive way. Your perfect weekend getaway might be an overnight stay at a bed-and-breakfast inn where you can read to your heart’s content.